Food and Drink Magazine — April 2016. Read the entire article here. Burton’s Grill and Bar approached GreenBanana with an aggressive search engine optimization request designed to drive more traffic organic to their 12 locations. The end result, over a 10-month stretch; more than 280 page one rankings leading to a boost in organic traffic growth of over 24% (54,945 sessions)! The GreenBanana team began by identifying the keyword phrases not only accurately described Burton’s service offerings but also contributed to search volume. GreenBanana’s 80+ step proprietary Search Engine Optimization Process combines both on page and off page optimization, social signals and ultra high quality site linking. Our process is continuously rewritten to adapt Google’s evolving algorithm updates. While the basic tenants of relevance remain steadfast, search-ranking factors continue to change and failure to adapt can negatively affect rankings. At GreenBanana our commitment to Pay for Performance SEO essentially mandates our ability to adapt to excogitating search engine rank factors; if we don’t our clients don’t rank and we don’t get paid. Hopefully you didn’t just skip ahead to this part, but these results can speak for themselves. 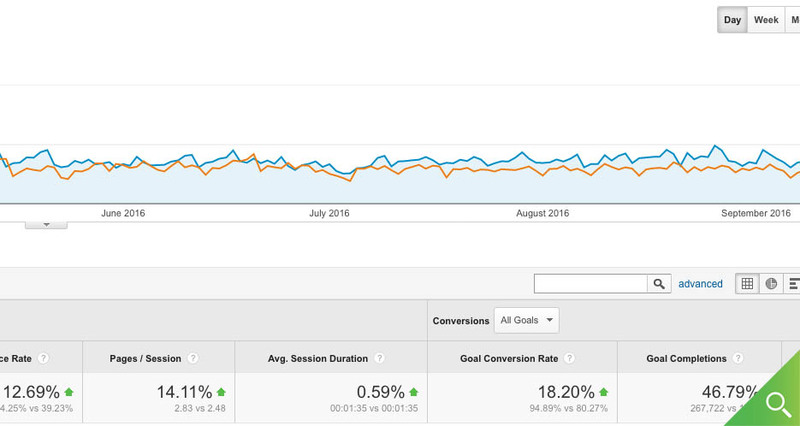 Below is 10 month year over year snapshot comparing of Organic ONLY Traffic and conversions on Google Analytics. Search engine algorithms continue to adjust ( typically more than 400 times per year) and often impact rank performance. GreenBanana’s commitment to Burton’s, as well as all other SEO clients, is to bill only for page one performance. If Burton’s page rankings drop so does their invoice. The Search Engine Optimization team at GreenBanana is constantly working to maintain and elevate Burton’s ranking to ensure that campaign is achieving optimal organic results.